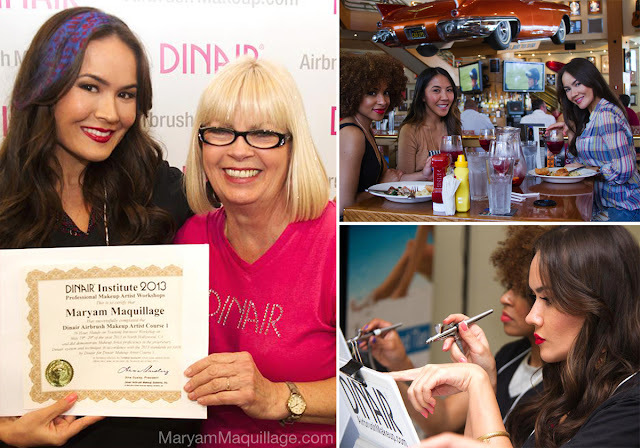 Maryam Maquillage: My LA Weekend with Dinair! Hello old friends and new! It's been a while since my last personal update, so today's post is very special and way overdue. 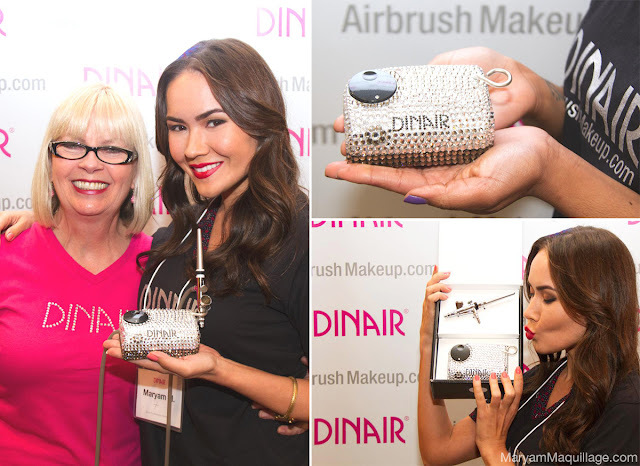 Last weekend, my blog and I hit a major milestone and were formally inducted into the Dinair Airbrush Makeup Family and today, I'm taking you on a mini-tour of my journey!! Thanks to all of your support and votes, "Maryam Maquillage" won Dinair's Beauty Blogger of the Year Competition and I was named as the top emerging blogger of the year! 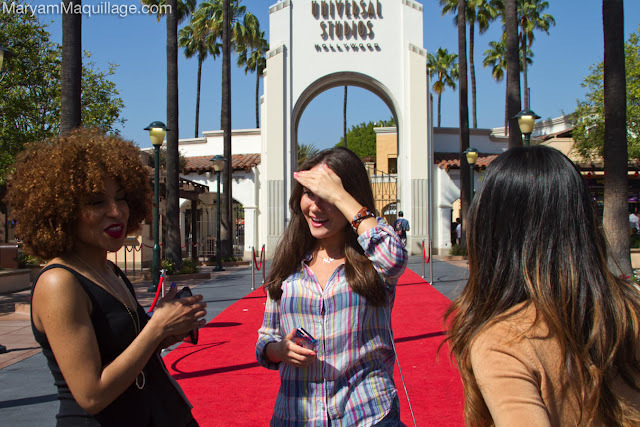 Joined by the beautiful Stephanie Lee aka LiquidLinerLover on YouTube, a fellow NY-based blogger / vlogger and winner in the top emerging vlogger category, we were flown to LA for an unforgettable weekend with the fabulous Dina Ousley and the amazing Dinair team!!! This was an experience of a lifetime and I can't express to you how thankful and overjoyed I am! Day 1 started at the hotel with a much needed, post-airplane Dinair-brush session! Next, we hopped on the trolley for an incredible backlot tour through the working film studios of famous movie sets including Jaws, Psycho, Jurassic Park and Back to the Future Trilogy, as well as various sound stages for shows like CSI, Tonight Show and The Voice. 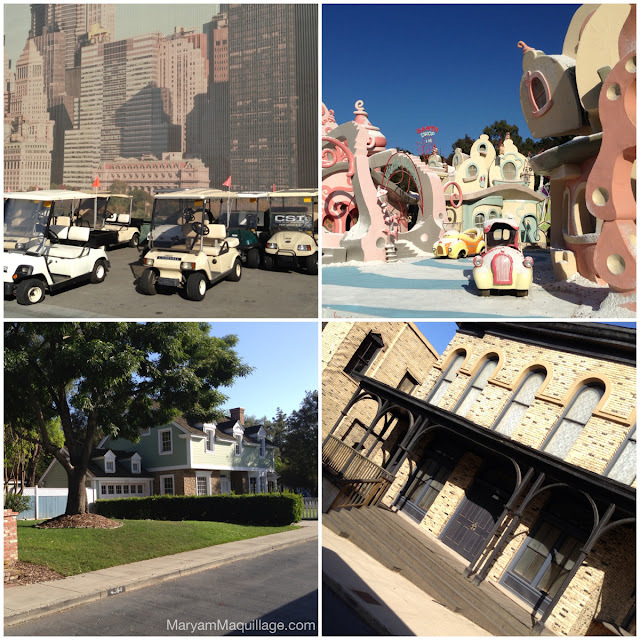 I was particularly excited about visiting the Wisteria Lane (Desperate Housewives), which looked sooo cute in real life -- I couldn't even believe I was on a set! After breakfast at the hotel on Day 2, Lee and I headed to the Hilton for an all-day Dinair Workshop Event. There, we were greeted by Dina Ousley, the amazing mastermind behind Dinair, whose personality and presence are truly larger-than-life!! Dina is incredibly dedicated to her company and is so hands on with all her students -- her devotion and passion are so palpable and inspiring!! Next, we wiped off our makeup and got to airbrushing! We took a Dinair crash-course, practiced important techniques, discovered amazing new products and I must admit, I learned A LOT. Although I achieved amazing results prior to this workshop, I was nowhere as knowledgeable about airbrushing as I am now. This course was really motivating and I can't wait to share my findings in my next Dinair makeup post! Lee is beyond STUNNING in her leopard eye makeup and pink highlights!! Please do yourself a favor and check out her blog Beauty By Lee and subscribe to her YouTube channel Liquid Liner Lover, you will learn so much from this beauty!! I feel so honored and blessed to have experienced this amazing journey with Lee -- she is so beautiful inside and out, as well as warm, kind, poised and crazy talented!! Not to mention, she's got the world's best hair!!! Thank God she's in New York, so I never have to go too long before hanging out with her again. And HANG OUT we DID!!! Check us out back in NYC at an OCC Event! THANK YOU DINAIR!!! WE LOVE YOU GUYS!!! Congrats!!! I love the cheetah print in your hair!! 3 words can only describe: "FAB U LOUS"
Love your blue leopard hair! Great post, seems like a lot of fun. Congrats again! Yay!!! I already follow Beauty by Lee's blog, Facebook & YouTube pages. I never thought I'd see the two of you talented ladies in one spot--estatic to see that!! !